Wistubs are equivalents of modern day bistros but that harken back to past times, offering home style food in rural, country settings. Wistub du Sommelier, one of the finest in Alsace and a favorite dining hangout of local vignerons and wine lovers, rarely disappoints. Wistub du Sommelier in is one of those simple, unpretentious places that is always packed with locals and astute wine and food lovers visiting Alsace. 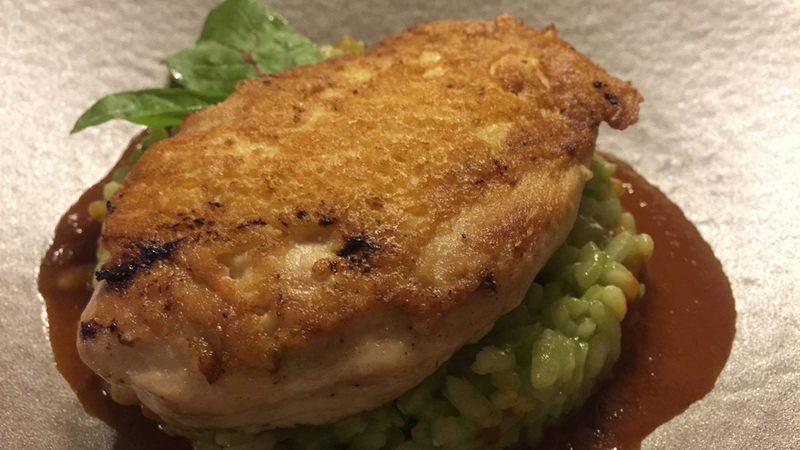 There are no bells and whistles, just simple but well cooked homestyle food and a fairly priced, if not large, wine list that offers many inviting choices. The restaurant building also contributes to the atmosphere that takes you back in time. It dates back to 1748 and is replete with wooden beams, exposed bricks and a working fireplace, not to mention the typically sullen, and at times harried, French waitstaff busy running around. In short, the Wistub is a nice place to kick back with friends after a long day at work, as the staff doesn’t fuss around the table all night long. On this night four of us had a good time and left thinking not just about the fabulous wine and food we had, but also that we’d look forward to going back, which is always a good sign. 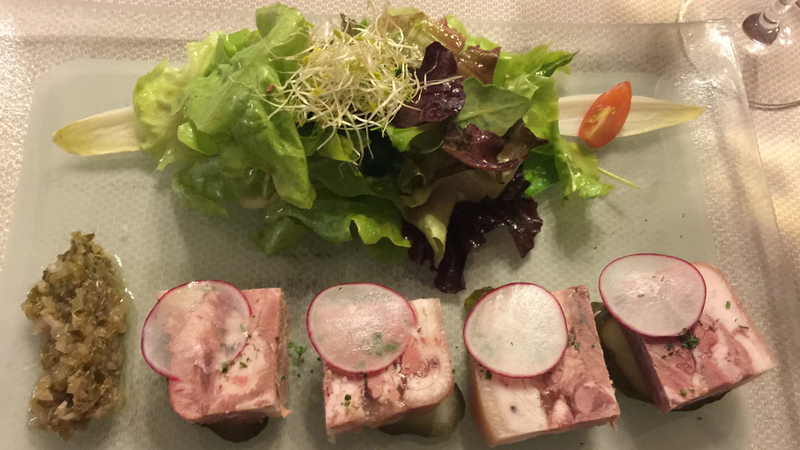 Wistubs are highly typical dining destinations of Alsace, best thought of as analogous to bistros but with lots of history and very strong ties to the local region’s wines and foods. In fact, wistub is the name used in the Haut-Rhin, while winstub is the name used for the same sort of establishment in the Bas-Rhin, which has a different linguistic base. In any case, these eating establishments were created in France after 1871 when the country lost one in the seemingly endless string of wars with the Prussians (Germans). It became commonplace then to avoid traditional brasseries and the public and to gather instead in the basement of farmers who made wine and cooked up hearty, home-style food. Wistub du Sommelier has been owned by Patrick and Antje Schneider since 2000, but it was founded in 1985 by Jean-Marie Stockel a former winner of the title of France’s Best Sommelier, who had worked with some of the best chefs of France, including Jung, Haberlin and Chapel, among others. That in and of itself is a pretty good calling card right there for all us Vinous readers and wine enthusiasts. On this night, the presskopf is in fine form, though I’ll never understand why they choose to cut it up in pieces (maybe for presentation’s sake?). This dish is often accompanied by a gribiche sauce that’s essentially a mayonnaise made with cooked rather than raw eggs, plus capers and pickles (clearly this being France and a “classic” recipe, no two people seem to agree on how it’s supposed to be made. You know, Italy isn’t the only country that will drive you crazy food-wise…). I find it’s a perfect accompaniment for cold meat and fish dishes in general. 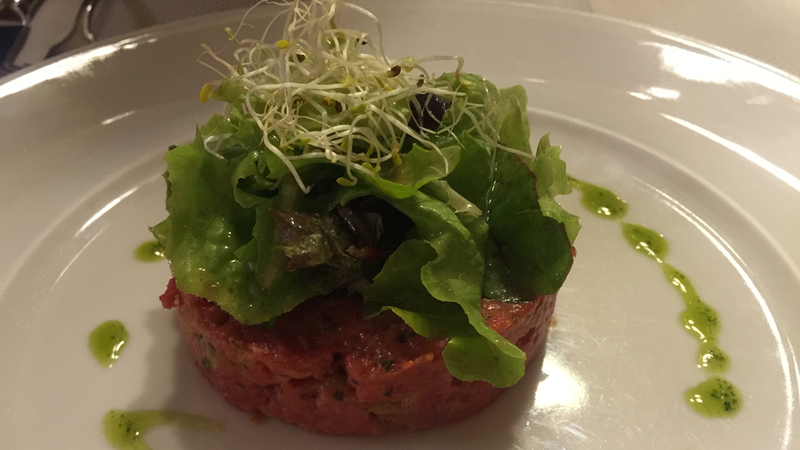 The tartare is flavorful, though I can’t but smile at the “seasoned according to the chef’s mood” phrase. 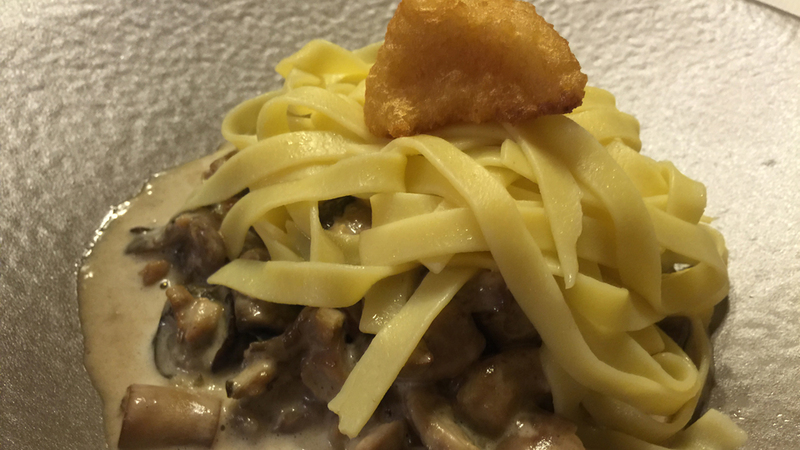 The snail and sweetbread dish is also satisfying, although it never ceases to amuse me to see how the French always seem to stick pasta as a side accompaniment in many dishes where no self-respecting Italian would ever think of adding pasta. Oh well, when in Bergheim… Overall, the food is savory and well-cooked; although service is a bit slow and the waitstaff seem stretched. The Wistub du Sommelier is a feast of Alsace’s wines, as it should be. We begin with the outstanding 2000 Kientzler Gewürztraminer Séléction de Grains Nobles, which is drinking beautifully and boasts Kientzler’s typical high acid, refined, very food-friendly style. 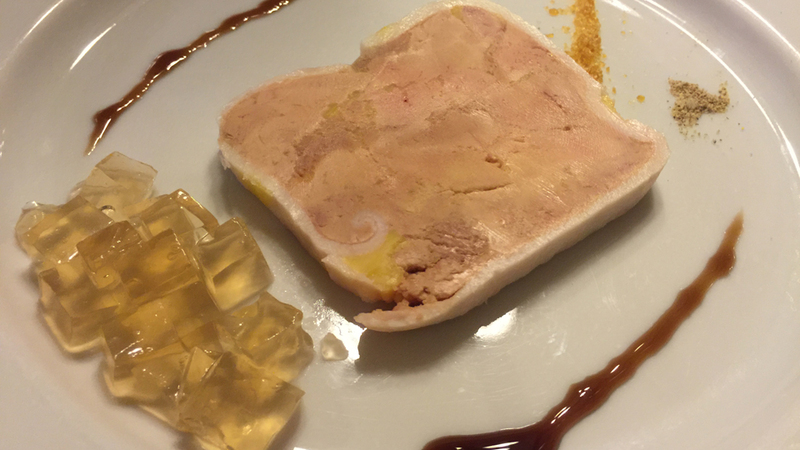 It’s a great match of course for foie gras, but for many other dishes given it’s acid lift. It would have matched well with scallops and a roast chicken, for example. The two wines that follow are fine if not especially memorable. The 2013 Clement Klur Riesling Katz is bright and savory, while the depth and sneaky concentration of the 2012 Etienne Simonis Sylvaner Vieilles Vignes speaks of its old vines. More interesting is the still very young 2013 Muré Pinot Noir “V”, made from the Vorbourg Grand Cru (hence the “V” name, as Grand Cru names cannot be used in association with Pinot Noir in Alsace, but only for wines made with Riesling, Gewürztraminer, Pinot Gris and the two Muscats, Ottonel and d’Alsace). 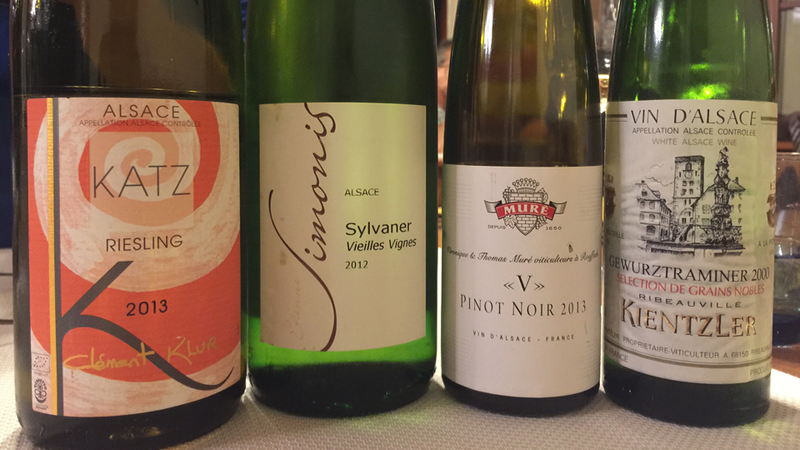 Over the years, Muré has justifiably earned a reputation as perhaps Alsace’s best Pinot Noir producer and certainly their Pinot Noir wines of 2012 and 2013 are clearly indicative of why that statement is well deserved. This specific bottling is still an infant and needs to be cellared for another five years at least for full enjoyment. It is rich in small red berry and aromatic spice notes that speak immediately of Pinot Noir, and an outstanding example of that.